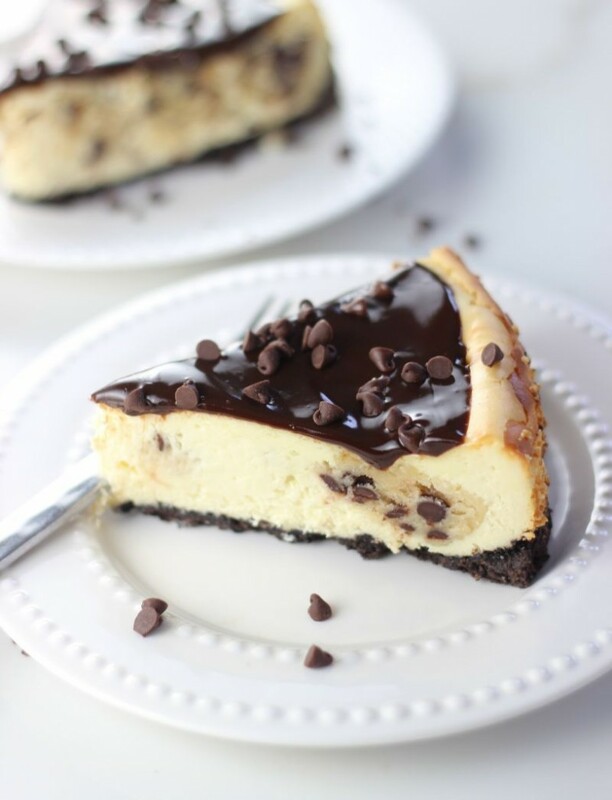 Creamy cheesecake with big hunks of chocolate chip cookie dough mixed throughout, over a chocolate cookie crust. This Chocolate Chip Cookie Dough Cheesecake is seriously out-of-this-world! 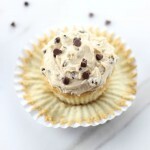 I promised that I would tell you all about how I went crazy with chocolate chip cookie dough. Now is that time. This cheesecake kicks off a series of three different chocolate chip cookie dough recipes. Chocolate Chip Cookie Dough Week, if you will. 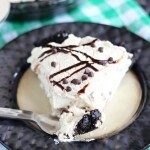 This Chocolate Chip Cookie Dough Cheesecake has been on my recipe To Do list for ages. I wanted to stuff a cheesecake with chocolate chip cookie dough and see what happened. Plain and simple. I felt pretty confident that it was going to work out swimmingly, but I still needed to actually execute the idea. I’m happy to report my delectable findings today. I’ve tweaked my favorite cheesecake recipe to a place where it’s perfect and I know longer want to adjust it at all. It’s tried-and-true, and no-fail. Sure, it cracks every time, but that’s my fault, not the cheesecake’s. And there’s an easy fix to that: hide it. Whipped cream, chocolate ganache, a fruit compote. Pick your poison, but if you care about a flawless cheesecake top, just hide it. That’s my philosophy. No matter what I do to this cheesecake base, it always works out. It bakes up to be perfectly creamy, smooth, and rich. So when I wanted to mix in balls of chocolate chip cookie dough to the batter, I’d hoped they would stay together in nice big hunks, like cookie dough truffles. They did! I didn’t want the cookie dough to melt into oblivion. I think that would actually be totally delicious too, but that’s just not what I was going for. 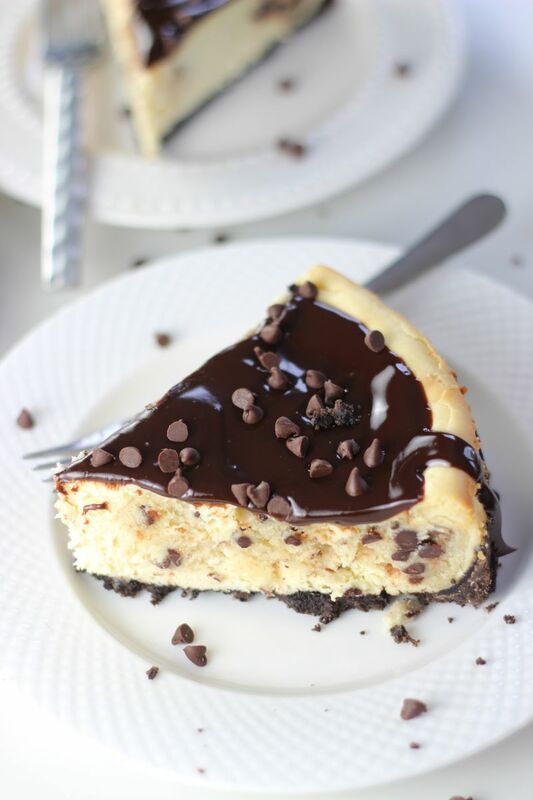 So when you take a bite of this Chocolate Chip Cookie Dough Cheesecake, you are likely to also get a big chunk of chocolate chip cookie dough too, and the combination is as delightful as you might think it would be to combine cheesecake and chocolate chip cookie dough. Just for good measure (and because the top is cracked), I loaded it up with an entire jar of fudge ice cream topping. Delicious, and a simple shortcut. For legit ganache, see here. But the fudge topping is a little less rich than chocolate ganache, and that’s exactly what you want. The cheesecake and cookie dough make this dessert so rich as it is. The fudge topping, while cheating a bit, was honestly the best direction to take. 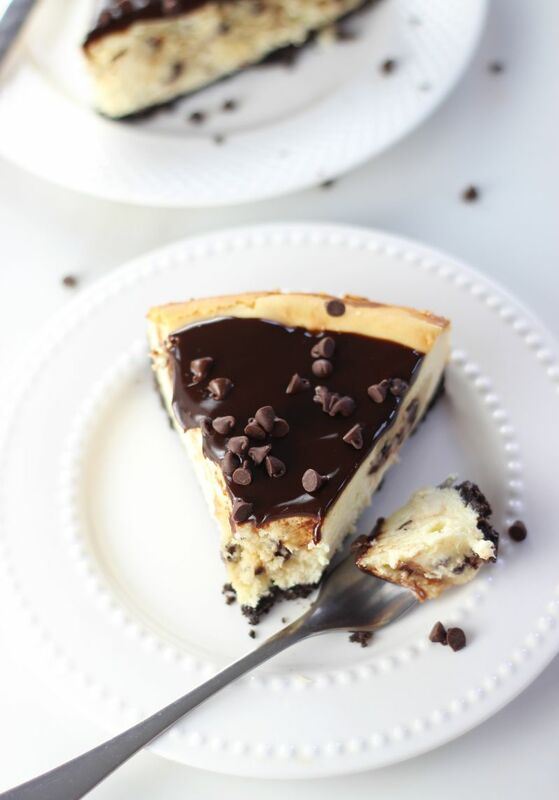 Rounding out this decadent Chocolate Chip Cookie Dough Cheesecake is a crust of crushed chocolate creme-filled Oreos. Now, are you ready to see what the rest of Chocolate Chip Cookie Dough Week holds? 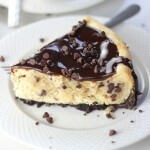 Creamy cheesecake with big hunks of chocolate chip cookie dough mixed in. In a large mixing bowl, combine butter, brown sugar, sugar, flour, and powdered sugar, and beat until well-combined. Pulse the cookies in a food processor until they are very fine crumbs. Press into the bottom of a lightly greased 9-inch springform pan. In a large mixing bowl, combine cream cheese and sugar, beating until smooth. Scatter the cookie dough balls evenly over the filling, and carefully press them into the cheesecake filling, adjusting the filling so that the cookie dough balls are completely covered. You can also gently rap the pan on the counter to shift the dough balls around. Bake at 325 degrees for 50-60 minutes, or until the center is still slightly jiggly, but almost set. Remove cheesecake from springform pan to a serving plate. Microwave the fudge topping for 45-60 seconds, or until melted and smooth. Sprinkle with chocolate chips. Cut and serve. Enjoy! I am speechless- this is stunning, pinning! It really is! It was delicious!!! Thanks, Blair! 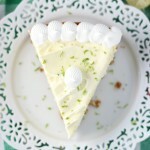 I’ll take a huge slice of this please!!! Yes!! 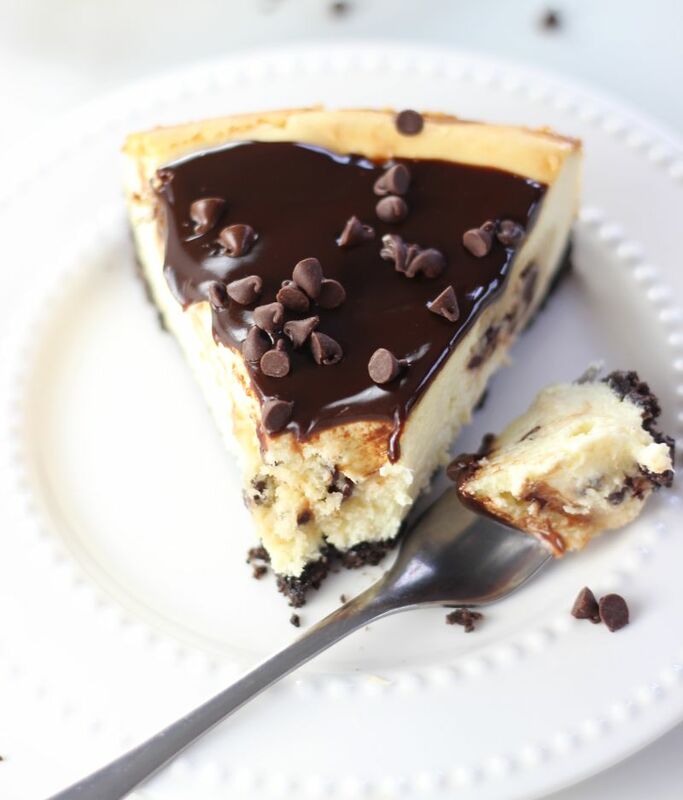 Cookie dough stuffed into a cheesecake has got to be the best thing ever! I like your philosophy Sarah because I do the same 😉 just cover the damn cheesecake with something and it looks perfect! 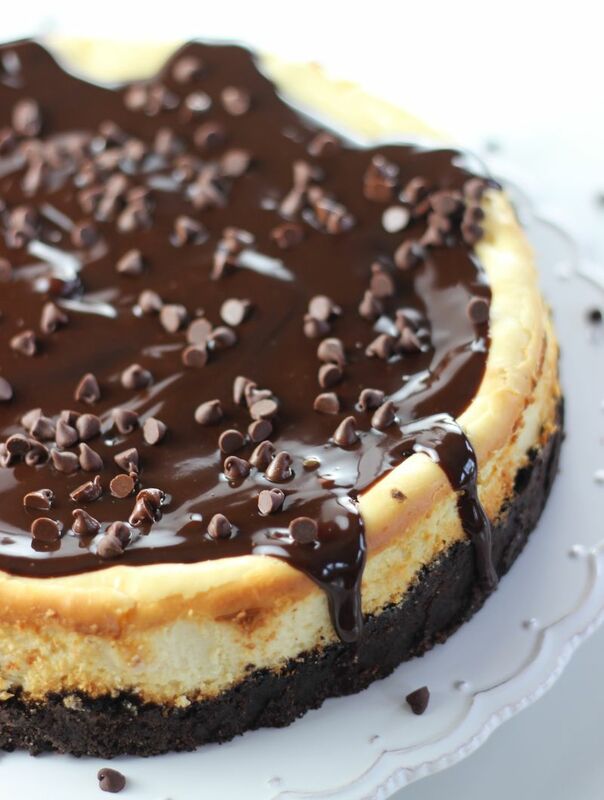 This cheesecake is totally calling my name, looks SO GOOD! I would love a huge slice of this glorious cheesecake!!! Those cookie dough bites inside have me drooling! Thank you! It was definitely divine! I always love ALL your recipes, girl!!! Thank you so much for stopping over, and for the pin! 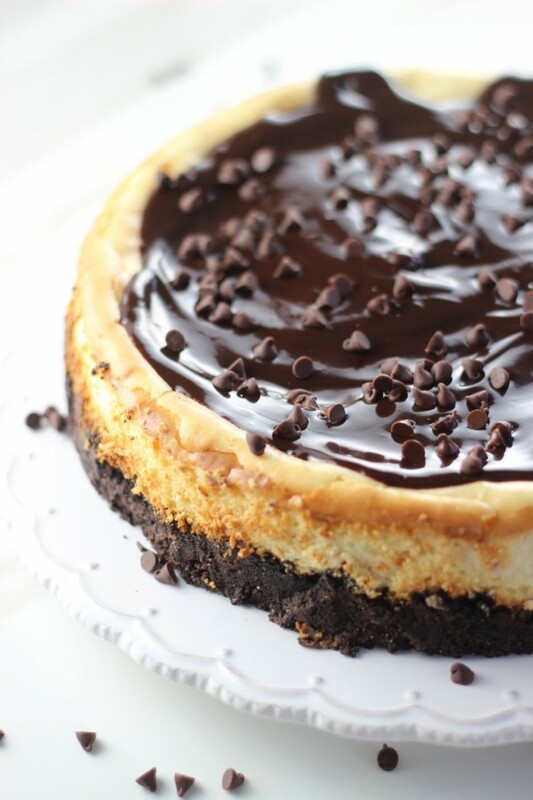 I have never made a cheesecake before, but I will make this one. It’s also on my Pinterest board. Definitely! Let me know if you try it, and how it turns out! Wow! This looks amazing! 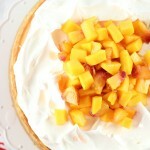 Pinned and Tweeted and planning on making this soon. Thank you for sharing on Snickerdoodle Sunday! Stopping back by to let you know that your cheesecake is one of our features this week on Snickerdoodle Sunday. Hope to see you there for the party today. Oh, I absolutely LOVE cheesecakes! Thank you for linking up with Thursday Favorite Things, hope to see you again this week! The pictures are gorgeous but has anyone actually tried making this? The proportions are all off. There is WAY too much crust for an 8 inch pan and the cookie “dough” doesn’t even form a dough and just tastes like sugar. I’m an experienced baker and was disappointed by this recipe. Now have to find another to salvage my ingredients. Hi Wendy: Sorry you didn’t enjoy the cheesecake. I’d be glad to help you troubleshoot. The cheesecake batter is the one that I use for almost every cheesecake on my blog, and have made it dozens of times. It’s tried and true. I also based this from a Taste of Home recipe that was well-reviewed. I didn’t have any trouble with the consistency of the cookie dough. Also, I have made cookie crusts with Oreos, shortbread, and even Nutter Butters, if the cookie crumbs are crushed finely, and pressed into the 8-inch springform pan, then the crust measurements are absolutely correct. Let me know if there’s anything I can do to help you otherwise. Thanks. I made this today for a big Sunday dinner and it was delicious!!! Many compliments! Not sure what country this is from but it looks fab and easy enough for me to try but I don’t understand the measurements am in England and we use oz or grams. 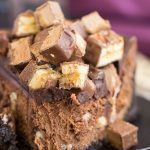 Is it possible to get the measurements off the ingredients in this form please. Hi Lisa!! This is US, and I don’t have the ingredients in oz or grams, but you could definitely find a substitution calculator on the internet for cups, tablespoons, etc.! I hope that you try it. It’s so decadent and delicious. Thank you! Making this now! Hoping it turns out! Can this be made ahead and frozen? It’s been requested for a future birthday. I saw your email, btw, and I’m not sure about covering the dough balls in flour – that very possibly could work, but I’ve never tried it. I adapted this from a Taste of Home recipe, and I’ve had great luck with it, but you could Google the Taste of Home version to see what comments were left on that recipe – maybe someone left a tip in the comments at the bottom. Good luck, Carol!! Sarah, THANK YOU for such a quick response !!! For some reason I couldn’t leave a comment here and that is why I emailed you. I’ve been checking my email for a response and thought, maybe you left it here. And here it was !!! I am going to make it and will let you know the results. The birthday girl’s special day is this coming Saturday so wish me luck with the Cheesecake. And thank you again ! P.S. I have to wait till I make it before I can rate it but I am sure it will be scrumptious ! Hi Carol! I’m glad you got my response! Did you make it yet? I hope it turns out well for you, and please let me know! Happy Birthday to the Bday girl!